This is a really simple brining and fermentation method for cabbage, giving it a tangy, bright lift while maintaining its fresh texture. Sauerkraut can be eaten raw, but it also benefits from being braised in a light stock, which reduces the acidity levels but none of the flavour. Cooked like this, it goes particularly well with a smoked ham hock terrine. When brining vegetables, a 6% salt to liquid ratio is perfect. 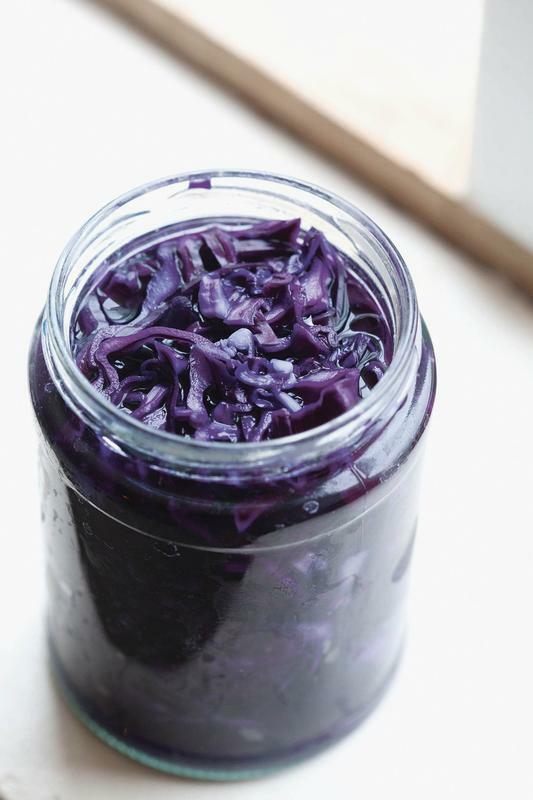 Sauerkraut is a really great probiotic food. For the brine, put the water and salt in a cooking pot and bring to a simmer, stirring occasionally to encourage the salt to dissolve. Allow to cool, then chill the brine in the fridge to about 5°C. Put the shredded cabbage into a bowl or plastic container and pour in the chilled brine so that it covers the cabbage. It is quite tricky to keep cabbage submerged in brine, but placing a sieve, the right way up, on top of the cabbage, works well. Cover the bowl (with the sieve still on top) with a tea towel or cling film and leave in a cool place, such as a pantry, with an ambient temperature no higher than 23°C, for 2 weeks. This will allow fermentation to begin without letting harmful bacteria multiply. After 2 weeks, drain the brine from the cabbage. Your sauerkraut is now ready to eat. You can either serve it as it is, in a similar fashion to coleslaw, or place it in a pan, cover it with chicken stock and simmer it very gently for 30 minutes or so. You can store the sauerkraut in a sealed Kilner jar or large jars in the fridge for up to 3 weeks.